Chris Froome's team Sky wilted at last month's Bergen world team time-trial as the 2017 Giro d'Italia winner Dutchman Tom Dumoulin led Sunweb to victory over the 45km route. This one is shorter, but Sky will have to think long and hard about the make up of the team they select in a tactical balance between the power for here and the lightweight climbers they'll need for the slog though the mountains. Pure climbers will be fretting about their eventual place on the podium when they look at this one with 15 cobbled sections from the fabled Paris-Roubaix classic which require power and endurance with middleweight riders doing well. It starts and ends early to avoid clashing with the World Cup final. 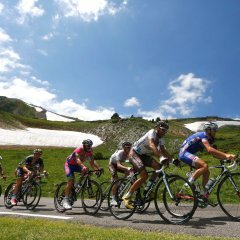 Not one, not two but three feared climbs as this Alpine stage tackles the Col de La Madeleine, the Col de la Croix de Fer and the Alpe d'Huez's 21 mythical turns to an eagerly awaited summit finish. With almost 71km in total of climbing, defending champion Chris Froome thinks the Tour can be won or lost here. A short, sharp shock which Tour organisers believe is thoroughly attackable terrain with a stunningly beautiful backdrop and summit finish at 2,215m where the oxygen is rarefied and the pure climbers will thrive. Froome and Dumoulin, both good climbers and good time triallists if they can get this far, are already on many people's minds when they look at this penultimate stage where a 31km, on-your-own, uphill slog faces all pretenders to the title, the podium and the top ten. What do you enjoy most about the Tour de France?